Sultanate of Oman, the beautiful and amazing country in middle east is a land of great opportunities and good culture. 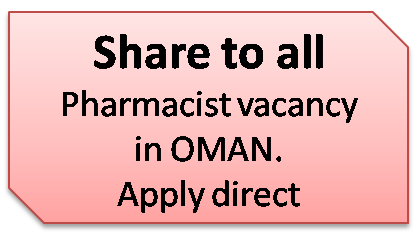 Here is an opportunity to become a pharmacist in sulatanate of oman. Mr Sultan Al qatabi, who is our facebook friend and pharmacist and a great gentleman informed us through message about a vacancy as given below. Any one interested to work in our organization must send follow requirements. 2-With three years of experience in his country of any nationality. 3-Passed promatric exam for Oman. 4-Done data flow or near to done. Without requirements please don't send.